Unfortunately, if you visit the company’s website you won’t find very much information that allows you to do a side-by-side comparison. In fact, if you really want to find out how these air purifiers are different, you have to download the product manuals and read through every page in order to discover what’s important to know. Lucky for you, we’ve already done that step for you and explain below how each Envion ionic air purifier is the same and in which ways they are different. Once you’re done reading this review, you’ll know exactly which air purifier is best suited for your needs. The Ionic Pro Turbo and Compact CA200 share a lot of features in common. This makes it a lot easier to compare these two Envion products because you know that you’re going to get certain functions no matter which device you choose. Silent operation – Envion prides itself on how quiet these air cleaners are when they’re turned on. While operating, you’ll forget they are even running. Ionic filtration – Both devices work by sucking dirty air through a set of positively charged wire electrodes. This transfers a positive charge to harmful allergens and smoke and causes these particles to get trapped onto negatively charged collection plates. This process is so effective that it captures particles as small as .01 microns, which equates to 99.9% of airborne germs. No filters to replace – Since these air purifiers operate through ionic filtration, the filters never have to be replaced. Just clean them with water to remove existing trapped particles to enjoy continued clean air. 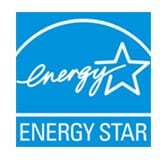 Energy efficient – Power consumption is so low that it costs more to operate a single compact light bulb. One touch operation – No confusing buttons or settings to contend with. A single button operation makes it easy to use. 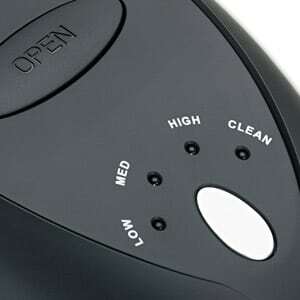 Cleaning indicator – This light alerts you for when it is time to clean the electrostatic collection plates. Sleek tower design – This feature allows these air purifiers to be placed practically anywhere inside a room. Put one in a corner, near a wall, behind a couch, etc. 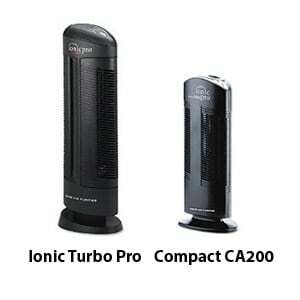 Fortunately, the differences between the Ionic Pro Turbo and Compact CA200 models are minimal. After looking at the comparable features below, you should have a good idea which air purifier would be better suited for your needs. Our recommendation is to focus on the square footage rating related to each product. If you’re looking for an air cleaner for a small room then the Compact CA200 is the best choice and will save you some money. For larger spaces, the Ionic Pro Turbo would be the better way to go. No specific square footage noted in the manual, but customer reviews indicate that it can handle up to 500 square feet of space. This is equivalent to a 20′ x 25′ room. Similar to the Ionic Pro Turbo, square footage information is also lacking in the user manual, however, customers claim that it can handle up to 200 square feet of space. This is equivalent to a 20′ x 10′ room. If you’re looking or an air purifier that uses a HEPA filter, instead of ionization, to clean the air, you may want to consider the Envion Therapure TPP240. 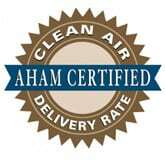 It’s considered one of the best air purifiers with a permanent HEPA filter.